1 photograph : b&w ; 10 x 13 in. 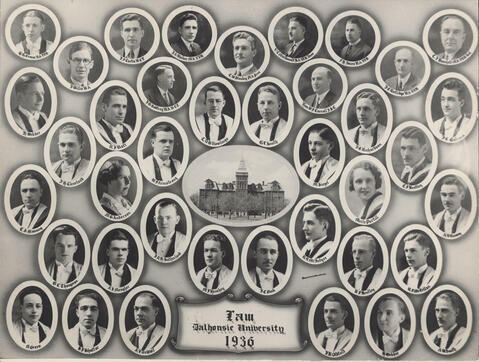 Item is a composite photograph of the 1936 graduating class and faculty of the Dalhousie University Faculty of Law. The photograph consists of portraits of G. H. Crouse; J. Willis; J. 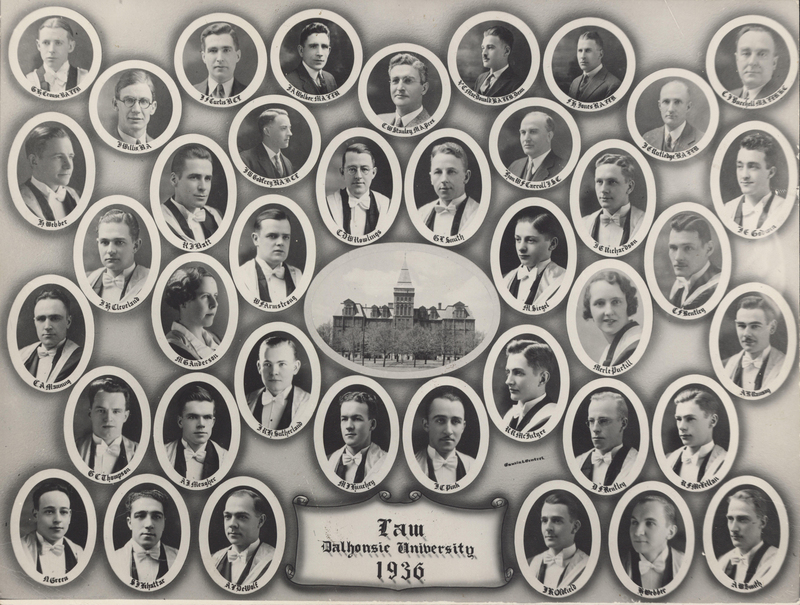 A. Walker; J. F. Curtis; C. W. Stanley (President); V. C. MacDonald (Dean); F. H. Jones; J. E. Rutledge; C. J. Burchell; H. Webber; J. H. Celeveland; R. J. Batt; J. W. Godfrey; W. F. Armstrong; C. D. W. Rowlings; G. L. Smith; W. F. Carroll; M. Siegel; J. E. Richardson; Merle Purtill; C. F. Bentley; J. E. Godwin; C. A. Manning; M. G. Anderson; J. R. H. Sutherland; M. J. Hinthey; G. C. Thompson; A. J. Meagher; J. C. Pink; R. R. McIntyre; A. B. Rarmsay; D. F. Bentley; R. F. McLellan; J. K. Oldfield; H. Webber; and A. W. Smith arranged around a photograph of the Forrest Building. There are remnants of glue and paper on the back of the photograph. Right edge of the photograph is slightly worn.